showing off that functional driver's side door! 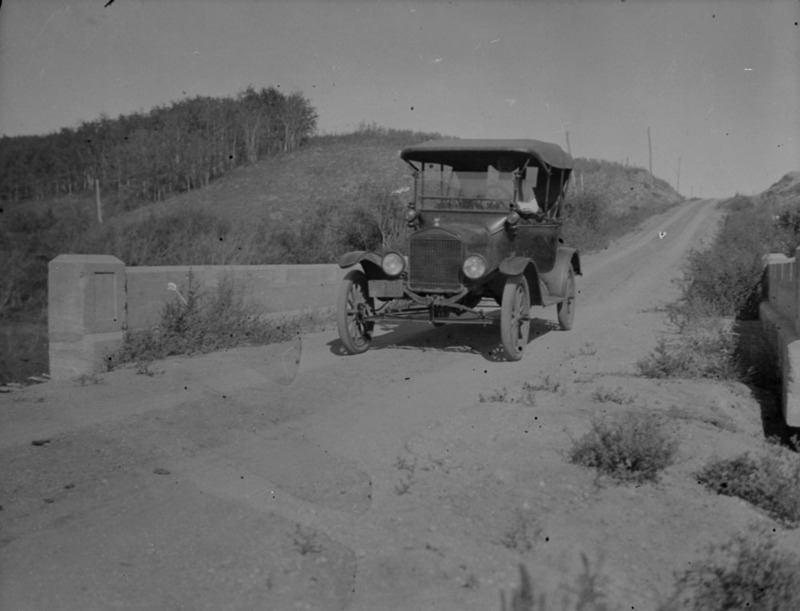 Captioned "Class 2 road and bridge across the Arrow River, Manitoba, 1917 (car is a Ford?)" 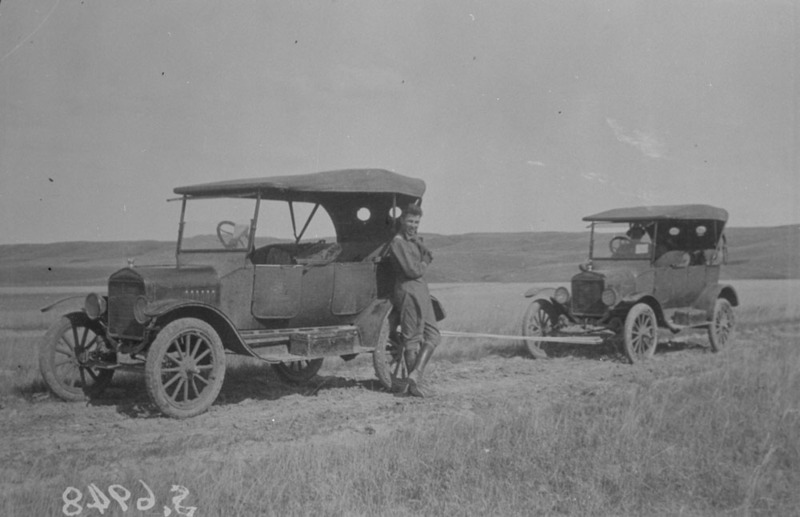 "Ford touring used bt E.W.Berry, DLS, 1920"
the middle picture negative was flipped (notice the backwards catalog number) making the cars appear to be RHD. Ah, Thanks Mark that's much better! Now you can see that Canadian "T"s even had functional PASSENGER side doors! Looks like a gun stock sticking up above the cowl in the lead Ford? 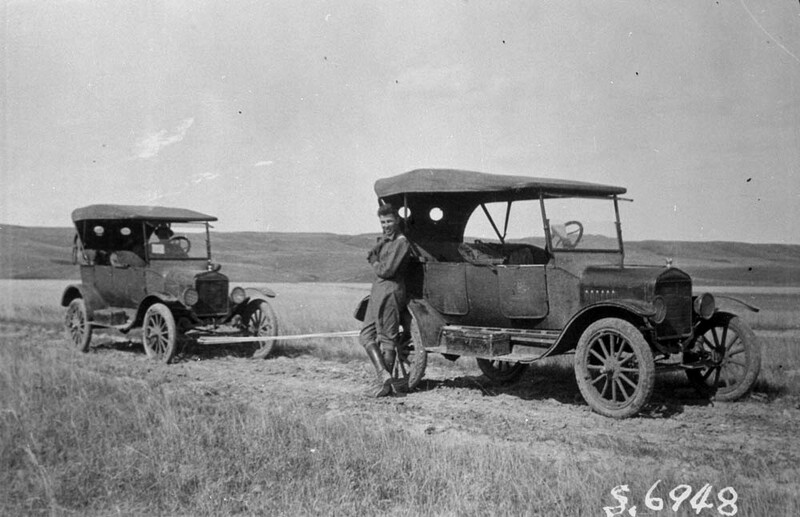 I understand you're not supposed to tow a T. Being as it appears they are a long way from civilization and repairs, What are your ideas as to the repairs going to be necessary due to towing and not the original break down? Could be a military exercise the guy in the photo is wearing military garb (leather leggins) and the cars have balloon tires that is probably a military spec. Judging from the mud on the tires, and what looks like a river in the background they're probably letting it dry out so they can restart it. David, Canadian cars came with 30 x 3.5" tyres all round. 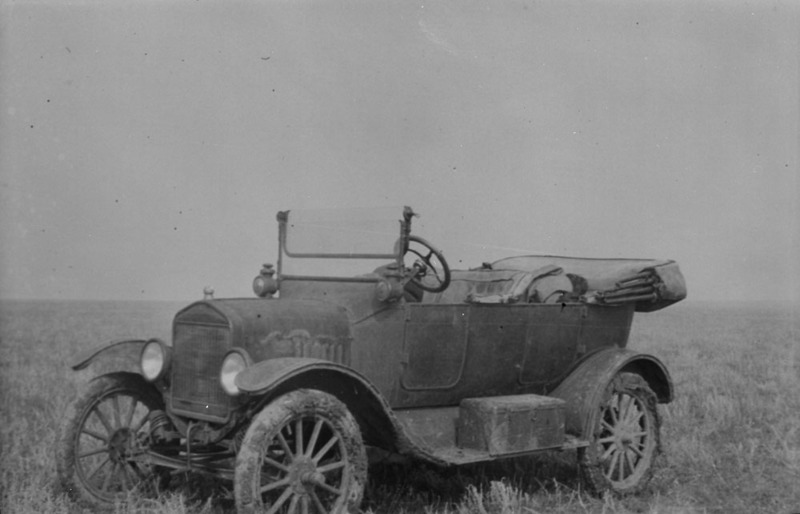 Note to the slant windshield and one man top on low radiator cars, both introduced ahead of US production. Note where the front license plate is mounted below the headlight. Isn't it true that you should not tow by the front axle but rather the front crossmember under the radiator? I heard you can actually pull the radius rod ball out of the retainer. I think you're right Gary but they had to find out the hard way and the 1920s was the perfect time to do just that.